Published on June 17, 2016 by Martyn. Be the first to comment! I’ll be heading up into the Highlands of Scotland later this summer to co-tutor a six-day residential course on writing for teenagers and young adults. Having taught numerous similar courses over the years for the Arvon Foundation at their centres in West Yorkshire, Shropshire and Devon, I’m very much looking forward to my first visit to Moniack Mhor, near Inverness. My fellow tutor for the week is the excellent, edgy YA novelist Cat Clarke – author of Torn, Entangled, Undone and, most recently, The Lost and the Found – and we’re honoured to have the former Children’s Laureate, Anne Fine, as guest speaker during the week. 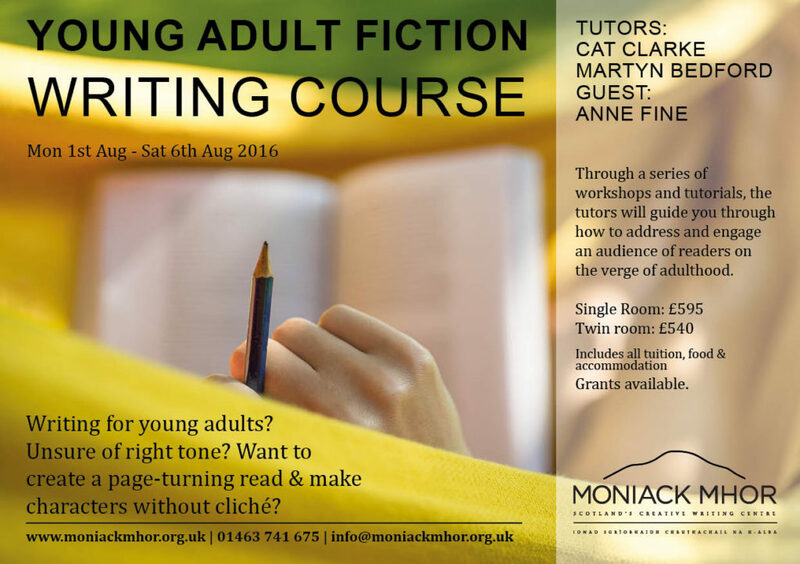 There are still a few places left on the course, which runs from August 1st-6th, so if you fancy spending a week writing YA fiction, attending workshops, readings and one-to-one tutorials – not to mention wining and dining with other aspiring writers in a beautiful part of Scotland – then please check out the details on the flyer, above, or click on this link to the Moniack Mhor website to make a booking. If you'd like to keep up-to-date with my news, you can do this for free by email or RSS feed. I'll keep your contact details private and you can unsubscribe at any time.